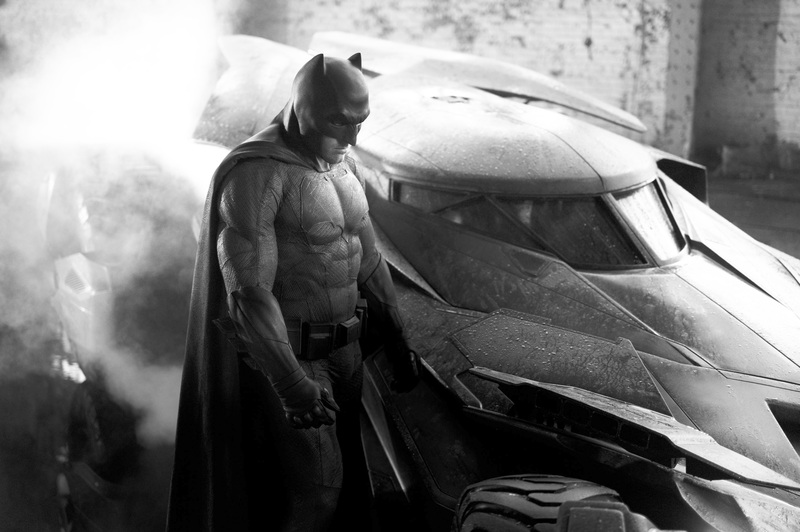 Still not sold on Batman vs Superman, but I don't hate the way Ben Affleck's Batsuit looks. Proving he is not JJ Abrams, one day after posting a pic tease of the Batmobile as it will appear in Man of Steel 2, Zach Snyder followed through on his promise for a fuller reveal with a new pic, posted minutes ago, that not only shows off more of the iconic car, but also reveals Ben Affleck's version of batman. 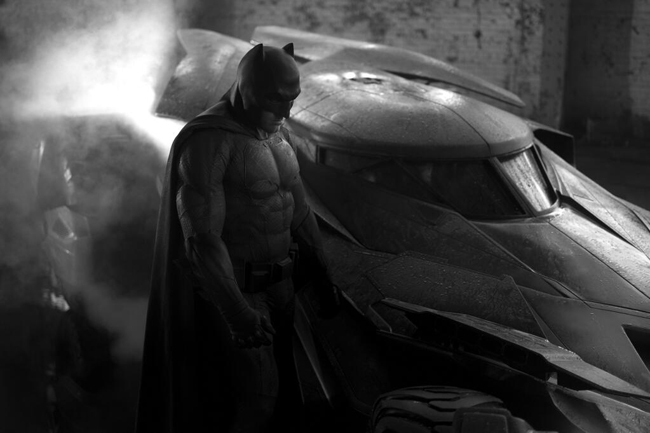 Featuring what is widely assumed to be Affleck suited up as the Caped Crusader, the photo confirms that previous hints that the film will take its cues, somewhat, from Frank Miller's 1980s take on Batman are true. While it's still very much the thick suit of armor we've come to expect in cinematic versions of Batman, it is also designed to resemble the aesthetic Miller favored. The Batmobile itself just looks like the version seen in Tim Burton's Batfilms. But the suit is another story. Clearly, Affleck will be bulking up for the role - the picture definitely conjures up images of the middled-aged Batman seen in Batman: The Dark Knight Returns. What's interesting, however, is that the suit itself is highly evocative of the uniform seen on the pages of Batman: Year One, with a rounder, old fashioned-looking cowl, and smaller ears that make Batman appear less a demonic personification of justice and more like an actual cartoon bat. It even appears to be black and gray. Compare the photo below to the one at the top of this page and you'll see what I mean. Honestly, I love the silhouette the suit makes. I've always preferred the simple gray and black suit seen in Year One and The New Batman Adventures over the ponderous quasi-exo skeletons of the two film series. 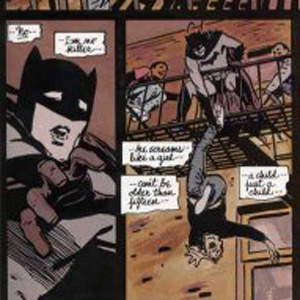 (That is not to say I prefer Frank Miller's Batman itself. But that's a conversation for another time.) Naturally, the textures obscured by black and white in this photo may turn out to look as silly as Superman's mesh uniform in Man of Steel, and those abs are almost comical. But for now at least, this seems at least partly on the right track. I'm still skeptical about Man of Steel 2: Batman Goes West. Obviously, aesthetic choices do not equal quality. But for the first time I'm also mildly looking forward to this movie. What do you think, readers? Sound off in comments. UPDATE: Coming Soon has posted a very high res version of the photo that reveals far more about the suit's textures. Special thanks to commenter Mr. Q for pointing this out. Click the gallery to see for yourself.